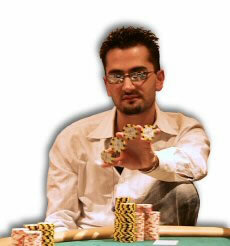 Antonio Esfandiari moved from Tehran, Iran to the San Jose, California when he was 9 years old. He became a professional magician at age 19. Once, he was invited to play poker with his good friend at a casino and that was the begining of his poker career. Antonio’s first major accomplishment was wiining the tournament at the Commerce Casino priced at $1.4 million. Mr. Esfandiari has one book and one DVD out so far. His book is titled “World Poker Tour: In The Money”. His DVD includes instruction on how to prevent and spot cheating at house poker games.